As far as my grrl scout cookies went, these were by far the best recreation of the original, which is why I had to save them for my last post. I used a simple chocolate wafer cookie dough and added a bit of peppermint extract. Then, I further “minted” them out by pouring a little of the extract into the dark chocolate topping. 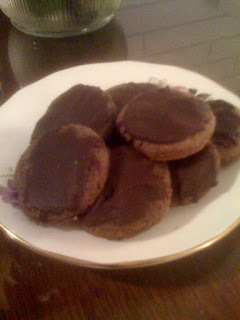 The cookies were perfectly crunchy and deliciously chocolate-y. They had a strong minty flavor, but it was not overpowering. It was very much like that sensation that comes from eating a peppermint patty. Hmm, maybe that’s what I’ll do with the rest of that peppermint extract. Anyway, I really enjoyed this particular baking project. I had a tough week last week and I very much used last Friday night to take refuge in my apartment and devote a couple of hours to something I really love. I’m also always glad to have cookies to share with friends and co-workers, because I like to think that it brightens up their day. This week really got me thinking about going into business and selling some of these cookies. I’m always looking for ways to monetize my life. So, if any of you know of any good commercial kitchens with time to rent, or about the permits and licenses you need to sell baked goods, please, please, please hit me up. Beat the butter, applesauce, sugar, and ener-g in a large bowl until light in color. Add peppermint and vanilla. In a separate bow, whisk together flour, cocoa, baking powder, baking soda, and salt. Add the flour mixture to the egg mixture and mix until well blended. Roll the chilled dough out on a lightly floured surface to 1/8th of an inch. These are thin cookies. Bake for 6 minutes or until firm. Melt the chocolate chips, earth balance, and peppermint together and stir well. Dip the tops of the cookies into the chocolate and smooth out with the back of a knife.